The PSLSU120 series of AC/DC LED switching power supplies provides a maximum power rating of 120W, with constant current ratings ranging from 0.1~5.71A and constant voltage ranging from 21~50VDC. These supplies have a 90-305VAC input voltage range, active PFC, an internal EMI filter, and high efficiency up to 92%. These supplies are housed in a 7.87” x 1.94” x 1.36” enclosure, rated to IP68 waterproof standards, which makes them suitable for harsh environments in industrial or commercial outdoor lighting applications. 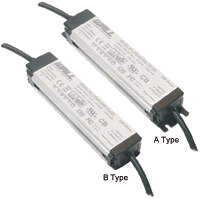 This series is RoHS compliant and has over voltage, over current, and over temperature protection. 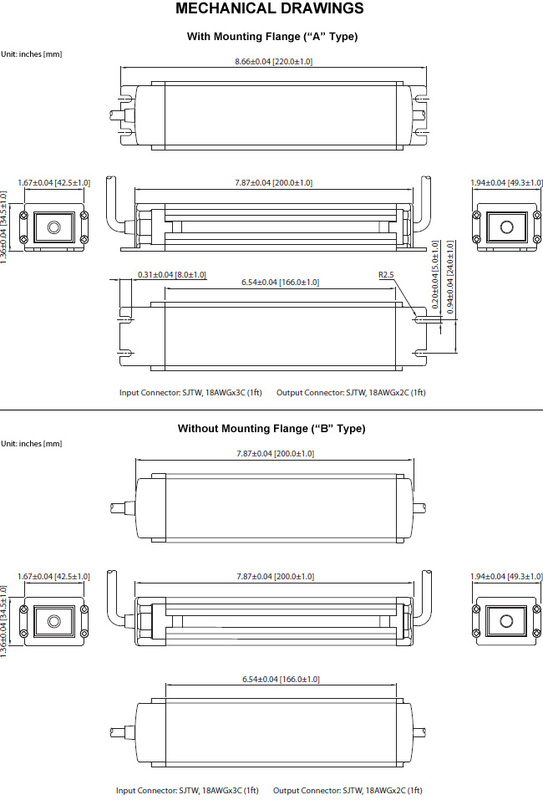 These supplies are available with a mounting flange (“A” Type) or without the mounting flange (“B” type). Notes: 1. For constant current (C.C.) mode, the output voltage will vary from Vo to 0.6 x Vo (See C.V. vs C.C. curve on page 4). 2. The red “X” in the model number can either be “A” for models with a mounting flange or “B” for models without a mounting flange.